You may well have heard of Jade Hopcroft, a solo artist who released her debut single on the excellent Laissez Faire Club label earlier in the year. You'll probably also know To Kill A King, and the two have combined - Hopcroft crafting a wonderful stop motion animated video for album track 'Wolves'. Watch it below. 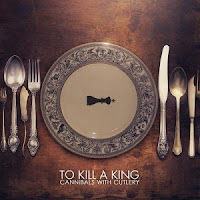 'Wolves' wasn't one of my highlights from the debut To Kill A King album, 'Cannibals With Cutlery', which arrived in March. It certainly isn't a dud track however, and this charming video only accentuates the quality of its accompanying music. Kind of the point eh? Nice work. Find more info at tokillaking.co.uk and jadehopcroft.co.uk.